The plight of a group of French citizens who, typically as a result of having been born in the US while their parents were there only briefly, have American citizenship that they say is causing them major difficulties and expense, has received potentially breakthrough coverage by a major American media organisation. In a story datelined today, Bloomberg reports how these ‘Accidental Americans’ in France are “[pressing French president Press Emmanuel] Macron for relief” from the US’s Internal Revenue Service, citing such difficulties as the fact that they are being denied basic banking services in the country they regard as their only home. “The plight of the ‘Accidental Americans’ in France – there are an estimated 10,000 of them – may be discussed by President Macron with his US counterpart Donald Trump during an end-April state visit to Washington,” the Bloomberg report says, echoing a report here last month. A number of French media organisations have also covered the situation affecting French citizens with American passports, including La Dépêche, in December, and Le Figaro and Les Échos in February. Bloomberg begins its report by telling the story of Marilyn Wiles-Mooij, who “doesn’t even know why her parents were in the US when she was born 67 years ago near Atlanta”, only that they came back to France when she was a month old, but who has recently been targeted by the IRS for $3,000 in tax it says she owes. The US says she owed this tax because she didn’t pay any income tax in France during a particular year, when, she says, she had been home taking are of her handicapped husband. Th Bloomberg report notes that France’s banking association says a ‘diplomatic way ‘ is best way to address the issue, but that some French banks – which it doesn’t name – “are nevertheless fighting FATCA in French courts”. The report also notes that France’s administrative Supreme Court “is due to rule around the end of the year on a claim that the application of FATCA is unconstitutional, on grounds that it’s not reciprocal, and that it violates French and European data protection legislation. 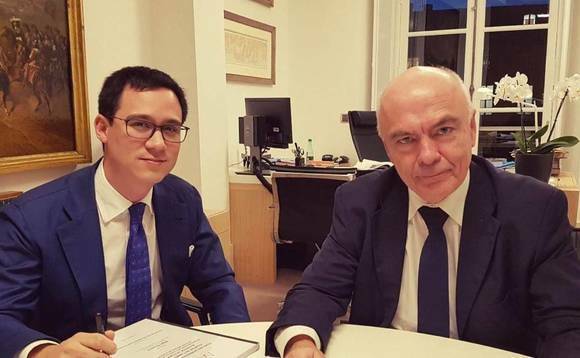 In a development that has emerged since the Bloomberg report was published, French Senator Jacky Deromedi has tabled a motion “inviting the government to take into account the situation affecting [France’s] accidental Americans”, which will be discussed in the Senate and a vote taken on 15 May, according to Fabien Lehagre (pictured left, above), a 33-year-old French citizen who has been leading the cause of les ‘Américains Accidentels’. Lehagre, who was born near San Francisco but brought to France at the age of 18 months by his (French) father, became increasingly frustrated by the growing demands of the IRS as FATCA took hold, and in 2015 founded the Association des Américains Accidentels (Accidental American Association, or AAA) in an effort to lobby for a fairer system. It now has around 440 members, with about 15 joining each week, Lehagre told Bloomberg. As reported here in February, French ‘Américains Accidentels’ like Lehagre have found themselves caught up in a problem that has been affecting American expatriates ever since the Foreign Account Tax Compliance Act was signed into law by President Obama in 2010. Because the US – unlike every other country in the world except Eritrea – taxes its citizens on their worldwide income even when they live abroad, and because the US has forced foreign financial institutions to help it to enforce this rule, American expats have increasingly themselves unwanted by foreign banks, insurance companies and wealth managers ever since the law was passed. To read the Bloomberg story, click here.